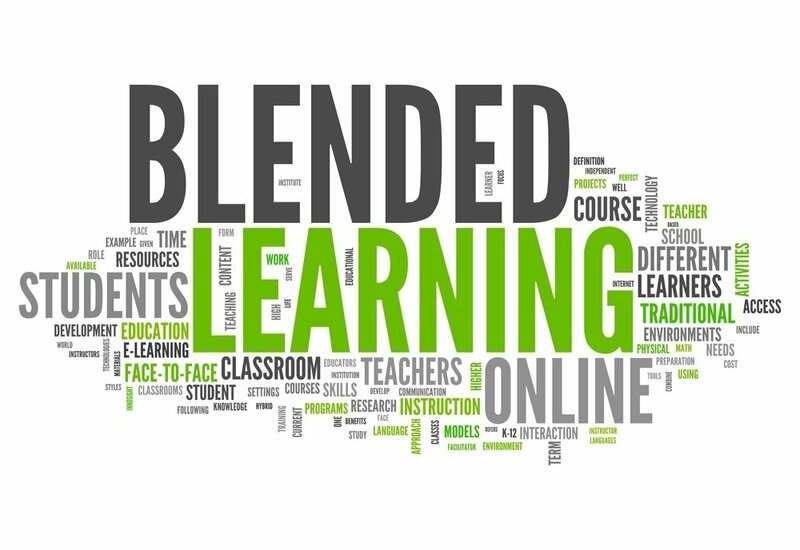 The phenomenal evolution of Internet in terms of access, content, and teaching platforms has resulted in many more individuals considering retraining through blended learning. A market niche for an online Professional Development Award (PDA) in Project Management was identified as a suitable programme to utilise and exploit the available blended learning platforms at Forth Valley College (FVC). The accredited course by Scottish Qualification Authority (SQA) and Chartered Managers Institute (CMI) was adopted as the pilot programme, and adapted for online delivery. The PDA in Project Management is designed to enhance and accredit the skills of individuals in the project management environment or entrepreneurs wishing to develop their own projects or ventures. The programme is taught entirely online through Moodle and e-portfolio (Mahara) with supporting live online workshops via Blackboard Collaborate. From the start, the emphasis has been on innovative practice and maintaining quality. Indeed, separate empirical research by Saporta et al in 2005, and Latchman et al in 2010 (cited by Dawson et al, 2012) have shown that there is very little difference in the overall outcomes between synchronous and asynchronous learning and teaching: the main determinant being the individual’s preferred learning style. However, due to physical barriers only a fraction of potential applicants can be offered places in traditional learning and teaching environment; thereby creating an under-class of learners without access to suitable teaching and training. From start the challenge was two folds: firstly to make the programme as inclusive as possible with respect to accessibility and participation; and secondly, to make the learning as vocational and relevant as applicable to learner’s requirements, thus resulting in increased learner engagement. To reconcile these two issues, a blended mode of synchronous and asynchronous model was developed based on the available technologies. The programme’s guiding principles remain inclusion and engagement. Inclusion refers to access to the course regardless of physical or financial barriers. Therefore, FVC has gained ILA approval for the programme, thereby helping attract the under-represented groups and provide viable progression routes. Engagement is achieved through virtual vocational training, i.e., the course teaches the mechanics of project management and provides the knowledge and tools to be applied to real projects being undertaken by the individual at work. To achieve this model Constructive Curriculum Alignment (Biggs and Tange, 2007) is applied to course development in order to enhance Learner experience and understanding. In accordance with this philosophy Intended Learning Outcomes (ILOs) are aligned with learners’ projects, thereby producing assignments that are tangible documents based on real life activities, vis-à-vis lecture-based academic scenarios.In order to maximise access and engagement the programme is delivered entirely online utilising three e-learning platforms: Moodle, Blackboard Collaborate, and e-portfolio. Moodle is adopted by many institutions as the de facto open source e-learning platform. As a Course Management System (CMS) it has remained relevant due to its flexible architecture that allows an objected-orientated approach with instructional content that can be broken down into manageable learning objects (Rice and Nash, 2010). Moodle facilitates the creation of powerful, flexible, and engaging online learning experience for learners, and is designed to be intuitive to use with a vast array of available help assisting teachers in creation of Instructional Design (Wild, 2008). Planned learning and teaching: all the course resources and lessons are provided as a library. The course is broken down into sequential chapters containing teaching notes; other media such as embedded YouTube webcasts, quizzes and activities; as well as assignment submission, feedback, and grading. Forums and workshops: where information is exchanged between tutor and learners through forums; and activities such as online Collaborate workshops and e-portfolio activities are planned and accessed. Administration: all learners are enrolled through moodle; and assignments are graded through moodle and kept within moodle environment for future internal/external verification and quality assurance. Blackboard Collaborate (formerly known as Elluminate) provides the synchronous live workshops for enhanced learner engagement and participation in a virtual community. Collaborate sessions can be arranged as activities within moodle and allow the participants to meet in a virtual classroom environment where they can discuss ideas, resolve queries, and create a virtual community. The facilities within Collaborate offer smart-board, web touring, and application sharing. Learners can also breakout into multiple virtual rooms for group activities and collaboration. E-portfolio (Mahara) provides learners with personalized online space for creating individual profiles; maintain diaries and documents; and create groups for peer review and collaboration. The portfolio is maintained online as an electronic archive, thereby offering security and mobility. The primary aim of the adopted Technology Enhanced Learning and Teaching method is to empower learners to take charge of their own learning, thus enthusing in them a sense of pride and responsibility. Perhaps the greatest achievements of the PDA programme have been in terms of its output and its knock-on effect on use of technology within the Organisation.The pilot cohort of 12 learners in the current programme consists of lecturers, managers, and external engineers undertaking the programme as part of their Continuous Professional Development (CPD). Their efforts have created the sum of output that exceeds the benefits offered by the programme itself. The individual projects are diverse and range from development of blended courses through to planning personalised eco-friendly dwelling, to Off-shore Generation and On-shore distribution of Green energy. The success of this approach to blended learning has helped in creating a standard template for blended learning at FVC. Further to presentations by the Head of Engineering Department, the PDA in Project Management is now a core PDA for the newly developed Scottish qualification of Higher National Diploma in Energy Skills, addressing the looming skills shortage in Oil and Gas, and Renewable Industry. In addition, through discussions with the Business Department at FVC, the PDA’s 3 HN credits at level 8 can also be transferred toward the CMI Diploma in Business Management, thereby providing meaningful and multiple progression routes for learners. Learning can best happen in an environment that promotes and encourages the efforts of learners. According to Hillier (2005) learning does not generally happen in a sterile environment. In fact, Lowe and Wenger (1991, as cited by Hillier, 2005) argue that the context in which people learn in order to maximise the effectiveness of teaching and learning must be identified and aligned with the overall objectives. Therefore, in order to ensure successful outcome, the programme’s goals and objectives have also been aligned with the learner’s goals and objectives.Given that there are three campuses at our Institution, Collaborate is beginning to be utilised for meetings and quality assurance across campuses, as well as assisting to deliver Staff Development Workshops online, resulting in reduced costs and lowered carbon footprint. The features in Collaborate such as Application sharing allows for examination of documents for quality, demonstrate and simulate specialist software packages, web tours for further developments, etc. It is believed that Collaborate has provided the tool to become more effective in teaching and efficient in conducting business. One area for further consideration remains empirical research into e-learning quality thereby allowing for feedback and evaluation. Therefore, contacts have been made with colleagues in the industry through LinkedIn.com working groups in order to establish the base for a common research by e-learning practitioners. Technologies afford us the opportunity to enhance teaching and learning in terms of support for people and objects that are not within physical reach. Driscoll and Carliner (2005, cited by Carliner and Shank, 2008) argue that technology enhanced learning is becoming more relevant in informal learning by challenging the established perceptions of objectives and evaluation. Moreover, technology can assist in competency identification and tracking learner’s progress whilst providing timely feedback and close the loop between tutor and learner. Jasmin Hodge: I work as the Organisational Learning Support Co-ordinator at Forth Valley College maintaining the e-learning platforms and provide support and training for all staff. I would just like to say I really enjoy learning online within the PDA course on Moodle. I feel involved; have support from my Tutor and peers; and being a learner on this PDA course has given me confidence to advise other lecturers to try online learning.As the Organisational Learning Support Co-ordinator I have also used this PDA model for other lecturers to use on all other online PDAs within the college.